When you want to trim any area below the neck, you’ll need a different trimmer than you’d use for your beard. We’ve put together this body trimmer buying guide to help you choose one that will work for you. We’ve done a ton of research and comparison in order to bring you the best of the best when it comes to trimmers. Before we get started, here are some things you should know. 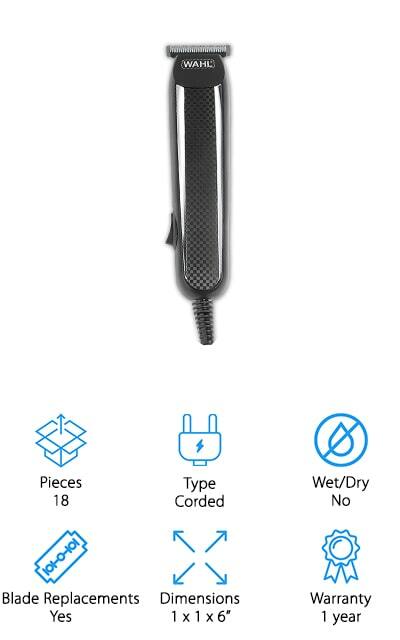 Pieces: How many additional attachments do you get with the shaver? It’s important to know what comes with the product you’re buying. That way you don’t over purchase accessories, or find yourself in need of something it doesn’t come with. Type: The trimmers on this list are either corded or cordless. Sometimes, they can be used both ways. It depends entirely on your own preference for use. Cordless trimmers can be used on trips and away from electricity, as well. Wet/Dry: When a trimmer or a razor can be used in both wet and dry conditions, it means that you can use it in the shower or outside of it. You can use it with shaving cream or without it. Blade Replacements: Does the razor come with replacement blades? Some on this list do so that you don’t have to immediately buy new blades when the included one gets dull. It’s useful to know, so we’ll let you know. 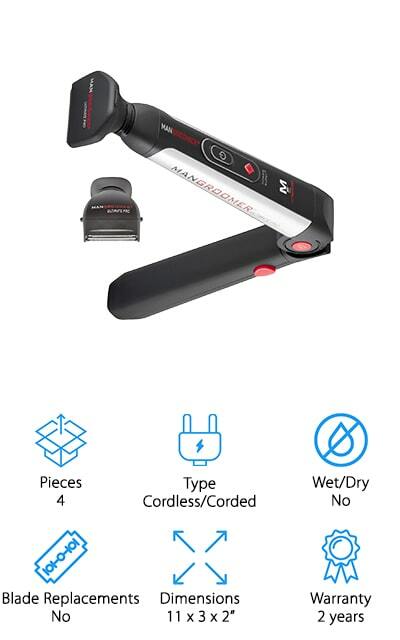 Dimensions: How big is the trimmer? Some of these are really large, in order to get to hard-to-reach places. This is important if you’re going to be traveling with it, or you’re making space for it in your bathroom. Warranty: A warranty shows you that a company stands behind its products. If the product fails or breaks during this time period, you can get a replacement product sent to you at no additional cost in most cases. Now that you know all there is to know about body trimmers for men, we can get to the body trimmer reviews! There are so many great picks on this list, but our top pick and budget pick are highlights. You should check them out first before moving through the rest of the list. If you’re trimming below the neck, you’re absolutely going to love how easy these tools make the entire process! Our choice for the best body trimmer is the OneBlade by Philips Norelco. It’s equipped to handle any length of hair, from a huge beard to sparse chest hair. There are two blades with this trimmer, one for your face and a second for your body. We love that they give you one of each! You can use it wet or dry, so you can shave in the shower or out of it. It’s got a skin guard so you can shave sensitive areas with that little bit of extra protection. You can recharge the trimmer, and with a full charge, it will last for a full 60 minutes of use. In addition, it comes with four stubble combs and a single body comb so that you can get the right cut the very first time, with all of your hair arranged for the evenest results. This trimmer is a great investment for your face and body! Gillette makes one of the most affordable body hair trimmers on our list with the Fusion ProGlide. 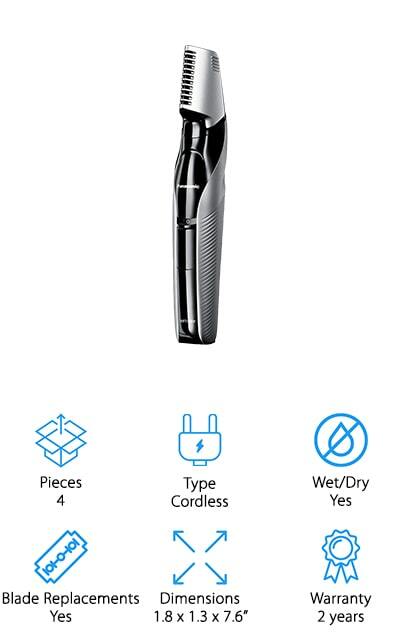 This razor comes with three combs and the battery so you can keep the trimmer charged for when you need to use it. This razor is remarkably slim and easy to hold, making it easy to maneuver while you’re shaving. No one likes an unwieldy, difficult-to-control razor! The three combs give you the ability to choose custom lengths for the hair all over your body, from your face to the rest of you. The precision edge gives you a clean line that you’re going to love showing off! Plus, the blades offer an extremely close, comfortable shave. Gillette’s Fusion ProGlide is made with Braun’s technology, so you know that it’s going to be worth it. Combined with an affordable price tag, you’re going to love this trimmer for all of your body grooming needs. It’s a great investment! MANGROOMER Makes this Pro Back Shaver that works well for getting to those hard-to-reach place son your back. It’s easy to use on thinner, sparser hairs, but it’s also got a Power Burst button to get through thicker coarse patches of hair on your back and body. There are two attachments that come with this shaver: an ultra-wide groomer for larger areas with longer hairs, and a foil groomer for shorter hairs and a smoother result. The flex neck on both heads allows the blade to follow the dips and rises of your back, for the perfect amount of contact no matter the angle. You can lock the length of the handle into place so you don’t have to adjust it every single time. It’s fast to charge and easy to use, with a charging light that alerts you to the status. You can use it with the cord as well for consistent results every time. Philips Norelco is back on our list with their Bodygroomer that’s designed for use all over your body. 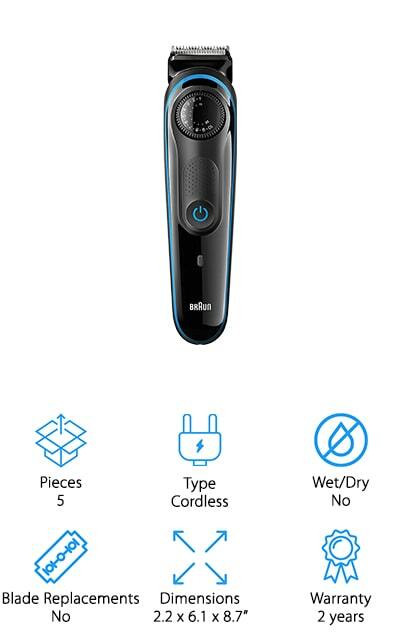 Its got a 3D pivoting head that contours to the shape of your body with no additional effort, giving you the ultimate close and comfortable shave. The blades and combs are rounded so you don’t scratch yourself, which is a great feature if you have particularly sensitive skin. There are five length settings so you can get the look that you want and need without having to go over an area more than once. If you want the areas from your neck down trimmed, this is a great device for you. You can use it in the shower or use it dry. After the initial 24-hour charging time, you will only need to plug it in for an hour to get a full charge. The two sides of the head allow you to shave and trim with one razor! Hattker makes one of the best male body trimmers that we found during our research. It comes with five different attachments so you can get a perfect size and shave on each area you need it for. It also comes with an adjustable beard trimmer comb, an adjustable hair comb, and four larger combs that you can use to detail and trim all of your body hair flawlessly. Get rid of what you don’t want and get precision shaves when you want them! The blades are self-sharpening when you use them, so they will last you a long time before you need to replace them. 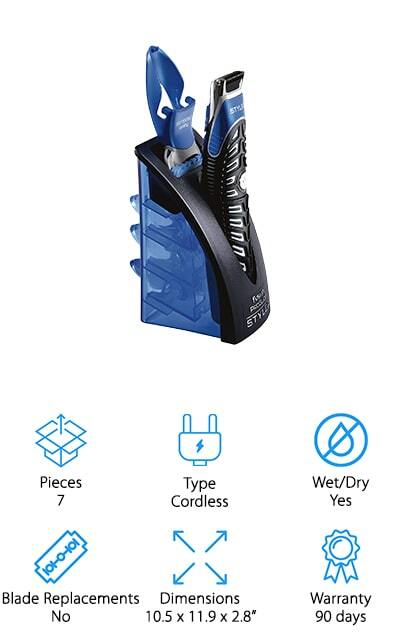 You can use this shaver in the shower as well as out of it – all guards and blades are water resistant and can easily be cleaned. Charge it for 90 minutes and you get a whole hour of shaving power! Plus, it has a travel lock so you can safely take it on trips! The Remington PG6025 definitely belongs on our list of the best body trimmers for men. When you need to shave just about anywhere, this kit has got your back! There are 14 different settings to trim every conceivable area, including an ear trimmer and nose trimmer attachment. The blades are made of surgical steel that sharpens itself during use. You won’t need to replace the blades too terribly often with this trimmer. On a full charge, this powerful shaver can be used for up to 65 minutes without interruption. When you’re doing, you can rinse all of the attachments without worrying about ruining it. It includes a hair clipper comb with 8 different available lengths and 3 beard/stubble combs. It even comes with a storage pouch so that you can take it on the road with you. Remington is a trusted name in personal care, and this grooming kit lives up to the brand name! Panasonic’s Milano All-in-One is the perfect gift for the man in your life that enjoys staying hair-free. It comes with a cleaning brush for the device, as well as a charging stand and mustache trimmer. It has everything that you need to get started – all you’ll need is replacement blades after you’ve used it for a while. The blades are angled at 45-degrees, as well as being durable and extremely sharp, so you get efficient, quick cuts and you won’t have to go over areas multiple times. There are 19 different precision settings with different lengths. You can detail and sculpt your beard and mustache, as well as getting rid of the rest of your unwanted body hair. The grip is rubberized for ease of use, and you can use it in the shower and standing at your sink. The cordless design allows it to run for a long time after 15 hours of charging. Wahl Clipper is one of the top brands for razors, shavers, and trimmers. The blades are made of their own specific high-carbon blend that means they are super sharp and will last you a super long time. There are eight different guide combs that you can use to get the perfect length and trim on your hair. It also comes with a six-position guide all in one format. You can keep your stubble or shave it all off, or use it to trim your longer beards and body hair. 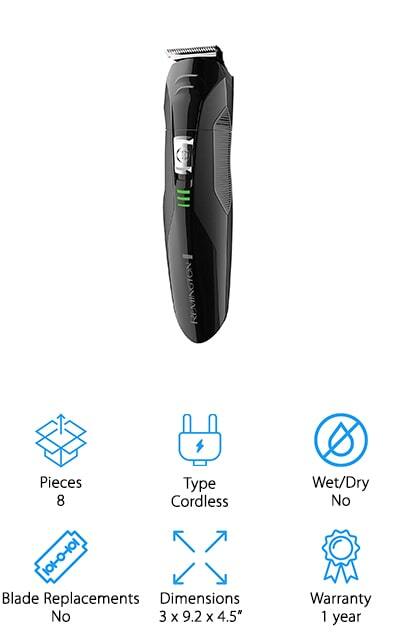 This is a powerful trimmer – it’s got enough power to cut through coarse, thick hair to give you the best look each and every time. This shaver gets you the results that you want – whether those are visible on your face, or you’re looking to groom below the neck. 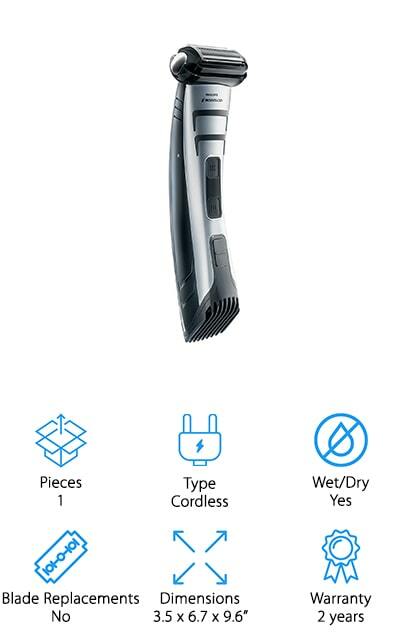 You’re going to love this trimmer just as much as we do! It’s the perfect gift for the man in your life! Panasonic makes the best full body trimmer on our list! As a trusted name in appliances, we expect a lot from this Panasonic trimmer – and it absolutely delivers. You can use it over all the areas of your body and it will glide gently over contours – perfect for shaving places on your chest and back. It also has rounded edges to reduce irritation and increase comfort no matter where you’re using it. The V-shaped head will help in more difficult areas, while the handle is slim enough to ensure that you’re getting the maximum amount of control. There are three attachments for different lengths to increase the versatility of the shaver. Plus, it’s fully waterproof so it’s good to use in the shower and out of it. It runs on a rechargeable battery so you don’t have to worry about managing a cord while you’re getting your shave on. 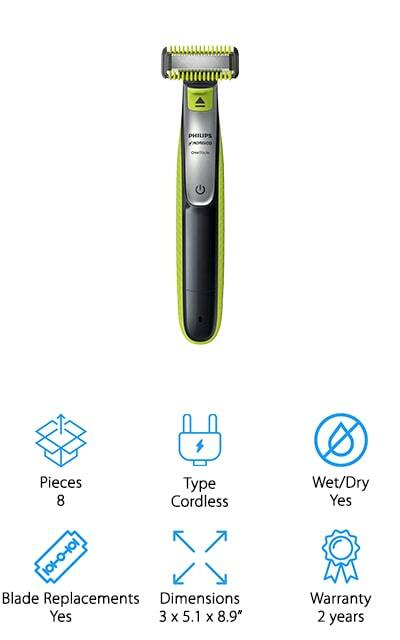 We love this trimmer and you will too! Braun is last on our list, but that doesn’t mean that it’s any less powerful than the other trimmers we’ve presented so far! This amazing cordless device will run for about 60 minutes with a full 8-hour charge. There are a total of 39 different length settings for each and every type of beard. These are presented in 0.5mm steps, allowing you to get the exact length that you want without having to settle for less. The blades will last the lifetime of the device because they are self-sharpening and won’t wear down even after use on coarse, thick hair. Its waterproof and you can run it under water to clean it, however, you should only use it outside of the shower. One of the coolest parts of this trimmer is that it comes with a Gillette Flexball Razor as well for smaller, more precise areas. 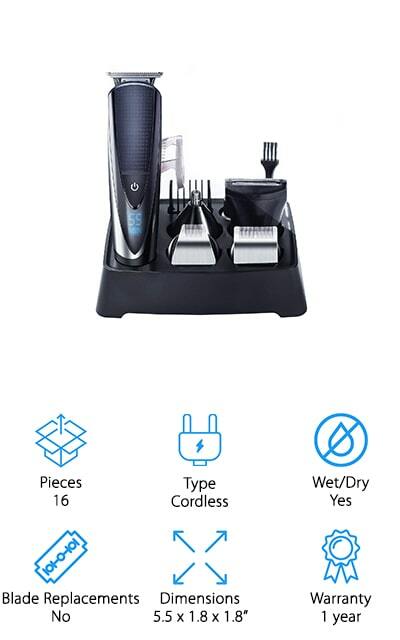 For all types of trimming and grooming, choose Braun’s BT3040.